Wyatt McMinn and supporters on the steps of the Clark County courthouse after victory, June 27. 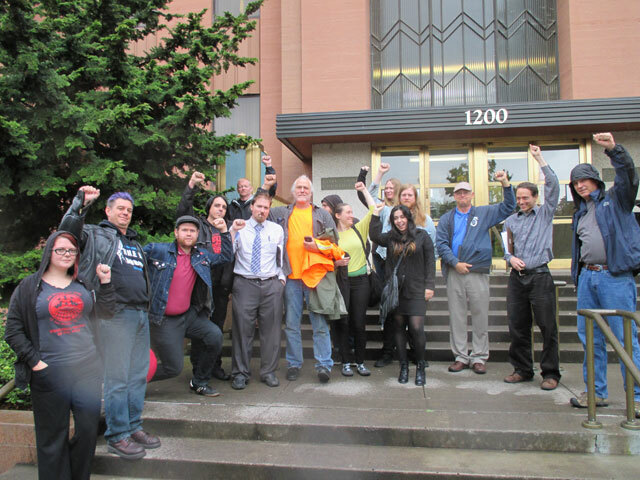 At a trial today, June 27, in Clark County District Court in Vancouver, Washington, Wyatt McMinn, the vice president of Local 10 of the International Union of Painters and Allied Trades and a class-struggle trade unionist, was found not guilty of first degree criminal trespass. On the courthouse steps after the trial, the union and left activists from the region who had come out to show their support cheered this victory for labor rights, democratic rights and workers solidarity. The case grew out of a labor protest at a Vancouver meeting this past September 5 of the “Freedom Foundation,” an anti-union lobbying outfit that is putting “right to work” initiatives on the ballot in the Pacific Northwest this year. Police intervened to prevent union supporters from being heard in the public meeting on a public university campus. The prosecution’s case consisted essentially of repeating the word “longshoremen” as often as possible (at least two dozen times) and linking it to “disturbances,” reports of “physical assault,” “destruction of property” and similar scare words. This was an attempt to play on the current anti-union hysteria being whipped up over the year-old lockout of ILWU longshore workers at Vancouver and Portland grain terminals. The “longshoremen” at the meeting could supposedly be identified, according to the prosecution, by their “orange shirts” and signs. 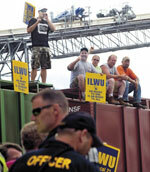 Although some ILWU supporters did take part in the protest, it was called by a group of construction union activists, and the only person with an orange shirt was Wyatt McMinn. These were distinguished from supposedly legitimate participants in the meeting who were distinguished by wearing suits and ties. The police called in emergency units as if preparing for a full-scale riot, but when they got there, as Sgt. David Henderson of the Vancouver Police Department confirmed under cross examination, there was no assault taking place nor could the officer “validate” that any assault had taken place. Instead there was no more than a heated discussion back and forth between the workers and the “Freedom Foundation” and others in suits and tries. As far as the charge of trespass against McMinn, defense attorney Therese Lavallee stressed that this was a public event on public property, and demonstrated by reference to a video that had been posted on-line by a right-wing group that McMinn was merely exercising his right to free speech and assembly. She also made clear that the way people were singled out to be told to leave was by their worker’s clothing as contrasted to the suits. Attorney Lavallee pointed to the contradictions between the sergeant’s police report at the time, as well as his testimony, which claimed that he had given multiple warnings to the defendant, and the video which was replayed several times showing that McMinn was handcuffed almost immediately after having complained that he was being “profiled.” Judge John Hagensen, while praising the police, based his decision on this last point, saying that the defendant didn’t have time to leave and thus was not guilty of trespassing. Hello, my name is Wyatt McMinn, I’m vice-president of Painters Union Local 10 here in the Portland/Vancouver area. I’m a supporter of labor solidarity and I was just on trial for standing up for working people against those who would take away our rights to defend ourselves and our rights. They call it “right to work,” but it’s really the “right” to slave, to not be able to stand up for your rights and the rights of your coworkers and ordinary working people like you and me. I was accused of trespassing in a public meeting in a public college. I pled not guilty, because I’m not guilty of anything but exercising my right, and your right, to free speech. And I am happy to say the court found me not guilty. This is a victory, a small victory, for democratic rights, for labor rights, for all our rights. Honestly, this case should never have been brought to trial, nor should there ever have been an arrest. I am proud to have stood up for the rights of working people in the state of Washington who are facing an assault on their rights by an outfit, the Freedom Foundation, whose idea of “freedom” is the so-called “right” to exploit our labor. I’m proud of the support I have received from workers and unions in the Columbia River area and beyond. Among them are the ILWU longshore workers who have been locked out of their jobs for over a year by filthy rich corporations who have brought in armed strikebreakers to herd scabs right here in the city of Vancouver, Washington in order to destroy their union. Those scabherders and scabs should be run out of town, they have no place here. And that’s why we have to stand together with all the victims of injustice, with those who are fighting to put an end to oppression. Because the struggle for civil rights didn’t end in the 1960s, and the struggle for labor rights is going on right now as we can all see by going down to the Port of Vancouver to join the pickets there at United Grain. If we stand together workers, have the power to win against capital, against all the powerful corporations, their bought-and-paid for politicians, the governments that do their bidding and their state. But we have to use that power or lose it. We stand for the policy of class struggle, and there is a long and illustrious history of that in the state of Washington.